Geçtiğimiz günlerde SCCM sunucusunda ki hata dikkatimizi çekti. 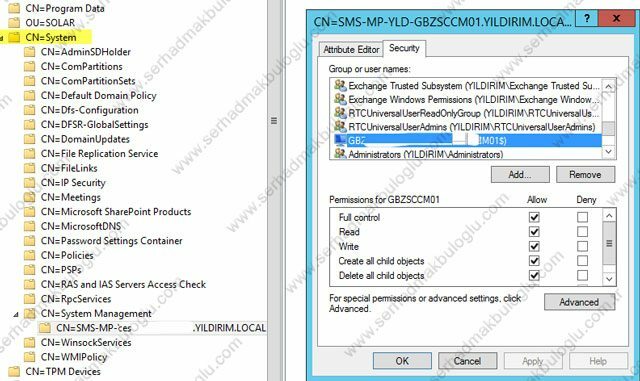 Detayları aşağıda yer alan hata mesajında, SCCM computer nesnesinin Active Directory’de yazma yetkisinin yer almadığı belirtiliyor. On 4/5/2017 07:29:39, component SMS_SITE_COMPONENT_MANAGER on computer sccm.mydomain.local reported: Configuration Manager cannot update the already existing object “cn=sccm.mydomain.local” in Active Directory (mydomain.local). Possible cause: The Active Directory object “cn=sccm.mydomain.local” has been moved to a location outside of the “System Management” container, or has been lost. Solution: Delete the object from its current location, and let the site create a new object. Hatanın giderilmesi için adsiedit.msc konsolundan System Management konteynırına SCCM Computer nesnesi için Full Control yetki vermelisiniz. 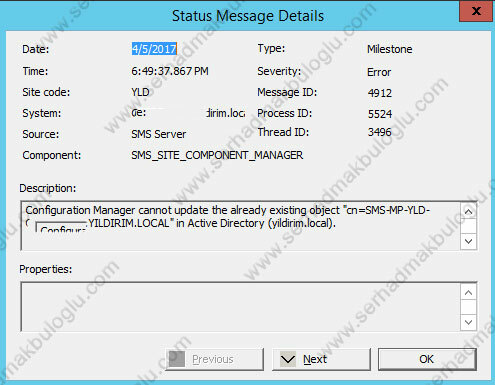 SMS_Site_Component servisini restart ederek durumu gözlemleyebilirsiniz. 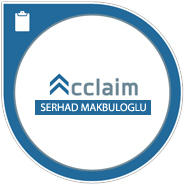 Önceki yazıVMware Certified Associate 6 – Data Center Virtualization (VCA6-DCV / 1V0-621) Exam Passed!